A progressive tax is a tax rate that increases as the taxable value goes up. 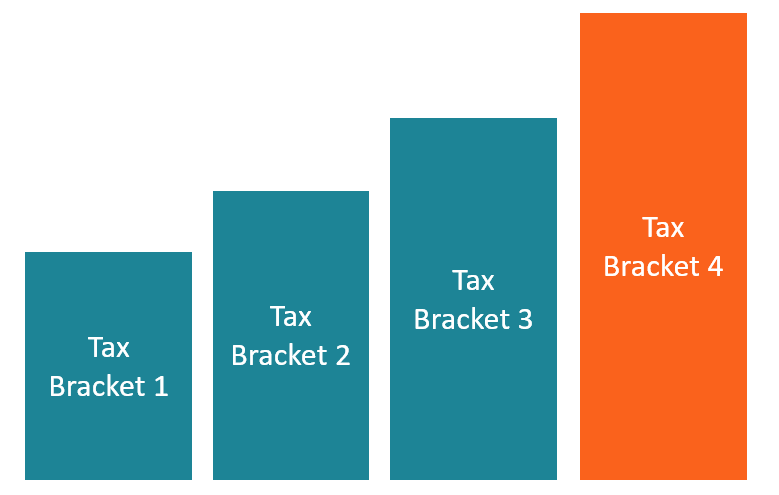 It is usually segmented into tax brackets that progress to successively higher rates. For example, a progressive tax rate may move from 0% to 45% in the lowest and highest brackets, as the taxable amount increases. In a progressive tax system, a taxpayer’s marginal tax rate is higher than their average tax rate. Various tax methods that governments may use include progressive, regressive, digressive, or proportional. The Progressive Tax System is one where the tax burden increases as the taxable incomePersonal Financial StatementA personal financial statement is a document or set of documents that outline an individual’s financial position at a given point in time. It is usually composed of two sections: a balance sheet section and an income flow section. increases. In some instances, there is a minimum tax-free amount where individuals earning less than the stated minimum taxable amount are not liable to submit any returns to tax authorities. Investment income taxes: These are taxes on most of the income-generating activities. It mostly falls on those with excess money to save and engage in investment. Tax on interest earned: Interest is only earned from savings or investments. Those who can manage to do these things are taxed. Rental earnings: Although there is a chance to deduct all the costs associated with building operations, once they are done, this is a very progressive kind of tax since it targets those who invest in rental property. Estate tax: It is a form of tax levied against those who succeed a deceased. It applies only if the estate of the deceased is above a certain amount as set by the government. Tax credits: These are benefits and perks awarded to less fortunate citizens by the government to save them some cash. They are many and might include earned income tax credit, elderly and disabled tax credit, child tax credit, or retirement savings contribution credit. There is a proper distribution of tax burden. Those with broader financial shoulders carry the heaviest burden. There is a safety net for the less fortunate in the society to ensure life does not become too harsh on them. The government receives a lot of revenue compared to a proportional tax system. It prevents political instability by ensuring that a few individuals cannot suppress others beyond certain limits. The opposite of the progressive system is the regressive tax rate where the tax liability reduces as the taxable amount increases. Regardless of the rate used, the government aims to collect money from citizens. After pooling all the money together, it can provide public goods and services like security and affordable healthcare. Note: Any amount in excess of the $50,000 is taxed at a flat rate of 35%. The total tax liability is $17,000 on a taxable income of $70,000. It implies that the average tax rate will be $(17,000/70,000) = 24.3%. From the calculations, it is evident that the average tax rate of 24.3% is less than the marginal rate of 35%. Remember the progressive tax system aims to get more money from those with higher purchasing ability. The government also uses other progressive measures to try and reduce income inequality as much as possible. Some of the progressive measures the government can put in place include imposing a property tax or even taxing luxury commodities heavily while exempting essential products from taxation. The economy of a country is developed through investments. Most of the time, the remainder of income after consumption is what is invested. In an efficient economy, savings are supposed to equal investments. What this means is that after a person consumes part of their income, rather than keeping the balance in an unproductive state, it can be put in an income generating activity. The case might not be exactly like this in a progressive tax system since those with more are taxed heavier. It leaves them with less disposable income and they might also not have the morale to optimize their productivity since the marginal income is taxed at an extremely high marginal rate. It will lead to reduced level of investment, which can have a detrimental effect on the overall economy in the long term. From the point of view for those who benefit from progressive taxes, their purchasing power becomes stronger. Also, the demand for certain commodities that are either subsidized or are part of the basic commodities increases. These two factors can promote growth and development in areas that would have been hard without the government intervention. The effect of a progressive tax on economic growth can have two interpretations, depending on your school of thought. Classical economists believe that economic growth should take a natural course without government intervention while the Keynesians believe in government expenditures and low taxes to stimulate economic growth. Inflation is a state where the price levels of goods and services keep on increasing without a corresponding positive change in standards of living. It reduces the purchasing power of money and also the value of investments. Thus, during inflation, those affected by progressive tax rates pay higher than the proper value initially set for them. Taxation is one of the greatest sources of government revenue. On the other hand, citizens look at it as a burden on them and some will do all possible to evade or avoid paying taxes. The conditions can be aggravated by some tax systems and rates like the progressive tax system that seems to punish hard work. For example, you can get a person earning $10,000 paying 10% of his or her earning while another one earning $70,000 is required to pay 30% of his/her income as tax. This can be seen as a great injustice to the hard-working citizens and a big demoralizer.